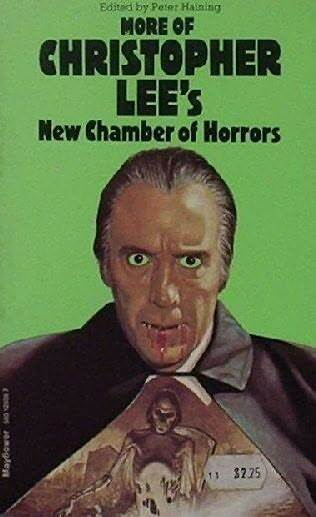 Features sixteen stories and an article about Christopher Lee. Also contains sixteen pages of black and white photographs from Christopher Lee's personal album. Short Stories include The Room in the Tower by E.F,Benson, Count Magnus by M.R.James,The Transformation by Mary Shelley, The Burial of the Rats by Bram Stoker, The Whispering Mummy by Sax Rohmer, The Leather Funnel by Sir Arthur Conan Doyle, Out of the Earth by Arthur Machen, The Magician by Lord Dunsany, The Empty Sleeve by Algernon Blackwood, The Thing on the Doorstep by H.P.Lovecraft, Return to the Sabbath by Robert Bloch, Four Ghosts in Hamlet by Fritz Leiber, The Devil, George and Rosie by John Collier, The October Game by Ray Bradbury, A Life for a Life by Dennis Wheatley and No Such Thing as a Vampire by Richard Matheson.